Every holiday, I try and find chocolates that are themed beyond simply a themed wrapper. Even that much can be hard to find (I went to three stores this year before I saw the KitKats with bats on the wrappers). With all the holiday merch out there, you would think chocolate companies (or at least candy companies) would put a little more effort in. Christmas tends to be okay, but Halloween isn't great. It's a candy holiday, but themed chocolate candy is scarce. 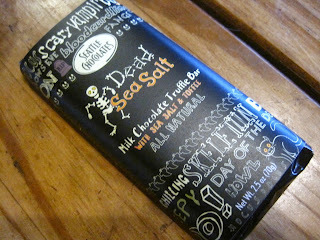 World Market, however, had two chocolate bars from Seattle Chocolates: Dead Sea Salt and Bloody Orange. Given that I don't like orange in chocolate, I stuck with the Sea Salt & Toffee bar. Theme-wise, it is simply a bar of chocolate, but the wrapper is fairly decorated with black coloring, a skeleton, and Halloween wording. It also says "Day of the Dead" on it, so it can double for Dia de los Muertos, too, right? You'll see that I arranged the bar with my glass skull (from Target last year) and a stone from the Dead Sea itself. As the back label is sure to mention, the salt in here is, naturally, not from the dead sea, although it is sea salt. Let's pretend that we can't see the palm kernel oil in the ingredients--really a shame to find, especially in a chocolate that feels the need to write "All Natural" on the front. But it's probably the oil that they use to add the "truffle" part to the bar. It's a pretty basic milk chocolate. Not quite gourmet, but perhaps slightly above candy-level. Maybe. While it has a more developed sense of richness, it tends toward the plastic texture. This texture is also its gooey texture, which is what I meant about the added oil being part of the "truffle" side: there is nothing else truffle-like about the bar other than the plastic gooeyness. The toffee comes in in little bits scattered throughout. It's fairly soft toffee, which means it isn't hard on your teeth. When the salt does come by, it's quite strength. At first I thought it could have more even, less harsh distribution. But then again, I do love salt and this salt might just be the best ingredient in this little confection. So I don't exactly mind if it overpowers the chocolate every now and then. I don't think the average taster will care about slightly plastic texture or sweetness. And for the average taster, salt in chocolate is still new enough to be its own novelty. As a chocolate bar, Seattle Chocolates presents a mediocre product. But as a Halloween chocolate, I quite like it. It's probably the best I'll find, living where I do. So while a three dollar chocolate bar certainly isn't trick-or-treating material, it makes for a nice little gift or party favor or themed snacking chocolate. Maybe next year they can imprint skeletons on the chocolate squares.